Aside from Rockefeller Center and Times Square, New York City’s top tourist attraction is Central Park. The tree-filled urban oasis stretches for approximately 2.5 miles, and receives around 42 million visitors per year. Here are a few facts about its iconic grounds. 1. IT WAS AMERICA’S FIRST MAJOR LANDSCAPED PUBLIC PARK. In the mid-19th century, New York City’s elite—who admired Europe’s well-tended public parks—proposed a similar space in their crowded city that would provide inhabitants with culture, fresh air, and exercise (but rumors abounded at the time that the real purpose was land speculation). After years of debate, the New York Legislature purchased a swath of land between 59th and 106th streets. A design contest was held in 1858, and a duo named Frederick Law Olmsted and Calvert Vaux won the competition with their "Greensward Plan.” (Greensward is a 19th century term for “lawn.”) Their vision, which called for a harmonious balance between natural and man-made elements, included terraces, bridges, and sunken roadways that would allow carriages to travel through the park without interrupting pedestrians. Today, Central Park is known as America’s first major landscaped public park. Later, Olmsted and Vaux teamed up to design Brooklyn’s Prospect Park, and Olmsted went on to create the U.S. Capitol’s grounds, the Biltmore Estate in North Carolina, and the site of the 1893 World’s Columbian Exposition in Chicago. Today, he's known as the founder of American landscape architecture. 2. IT WASN’T EASY TO BUILD. Central Park might look effortlessly beautiful today, but it was once filled with mud, swamps, and rocks. Trees and plants couldn’t grow in its soil, so 500,000 cubic feet of topsoil was imported from New Jersey and dumped onto the grounds (some modern estimates indicate that there’s now a total of 10 million cubic yards of New Jersey topsoil on Central Park). Its swamps were drained, and city water pipes were installed to create its lakes and streams. The park was also strewn with rocks, which had to be blown up with gunpowder and carted out via carriage. In all, the project's 20,000 laborers used more gunpowder to rid Central Park of unwanted rocks than soldiers used while fighting the Battle of Gettysburg. 3. IT ONCE HOUSED A VILLAGE. Before Central Park was built, about 1600 people lived on the land. Many of them were residents of Seneca Village, a small community that was founded in 1825 by free African-Americans. The territory included three churches, two schools, and three cemeteries. A large Irish population also lived in Seneca Village, as did some German residents. In 1855, Seneca Village was destroyed to complete the park. Its residents were deemed “squatters,” and they were either paid for their land or forcibly evicted by the city. Seneca Village was all but forgotten until 2011, when the Institute for the Exploration of Seneca Village History was granted permission to excavate the site. Diggers ended up collecting 250 bags of material, which might teach historians more about the individuals who once called the area home. 4. IT FELL INTO DECLINE—BUT IT MADE A COMEBACK. Despite its grand scale, Central Park eventually fell into disrepair, thanks to bureaucratic struggles with the notorious Tammany Hall political machine, the departure of key park overseers and designers, and a changing urban environment that was dominated by the newly-invented automobile. The park became overgrown and dilapidated until Mayor Fiorello La Guardia instructed urban planner Robert Moses to clean it up in 1934. Moses built brand-new playgrounds, ballparks, and a skating rink; raised funds for sculptures and a carousel; renovated the zoo; and helped restore the Park to its former glory. In 1970s, the Park entered another rough period thanks to budget cuts and mismanagement. Once again, it became downtrodden, dirty, and filled with criminal activity. In 1980, a private fundraising body called Central Park Conservancy was created. With time, donations, and the help of volunteers, the Park was gradually transformed into the verdant space we enjoy today. 5. IT ONCE HAD SHEEP. Ever wonder how the large, grassy Sheep Meadow got its name? It was once filled with fuzzy livestock, which grazed there from the 1860s until the years following the Great Depression. Eventually, the animals were relocated to Prospect Park, and their home was transformed into the Tavern on the Green restaurant. Afraid that impoverished city residents would eat the sheep, officials finally moved them to a farm in the Catskill Mountains during the Great Depression. 6. IT YIELDED A SCIENTIFIC DISCOVERY. In 2002, scientists discovered a new animal species in Central Park—a tiny centipede called Nannarrup hoffmani that’s only four-tenths of an inch long. The creature lives in the park’s leaf litter, which is the mixture of twigs, fungi, soil, and rotting plant leaves that builds up over the grounds. Fittingly, the bug is thought to have arrived in potted soil—making it a New York transplant in every sense of the phrase. 7. IT HAS A FAMOUS CAROUSEL. Central Park’s elegant, 57-horse carousel is one of the nation’s largest—and oldest—merry-go-rounds. Built over 100 years ago, the vintage treasure was found abandoned in an old trolley terminal in Coney Island. It replaced the park’s first three carousels, as fire destroyed two of them and a live mule or horse was said to power the original. 8. IT WAS ONCE COVERED BY GLACIERS. Ever wonder why Central Park has so many dramatic rocks and boulders? They're there because of glaciers, which melted 12,000 years ago, leaving behind the debris they accumulated during their long journey across New York state. 9. IT’S BEEN FEATURED IN MANY MOVIES. 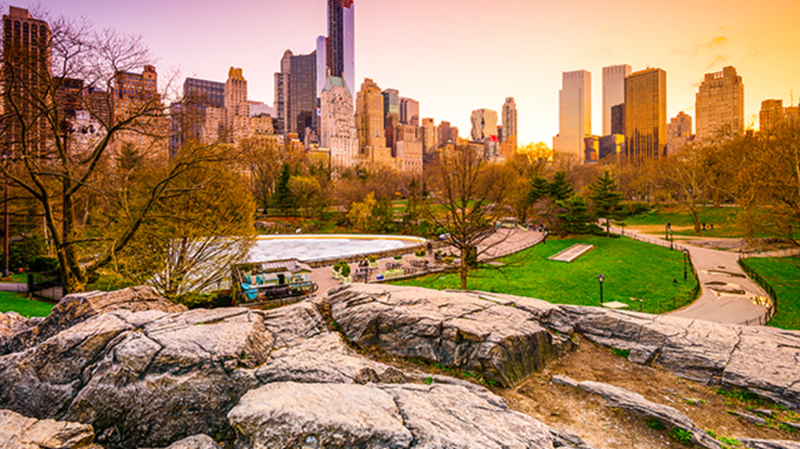 With its unique blend of natural landscape and urban skyline, it’s no surprise that Central Park is one of the most filmed locations in the entire world. In 1908, the original cinematic version of Romeo & Juliet became the first movie to be shot on its grounds. Over the years, countless blockbusters have followed suit, including Breakfast at Tiffany's (1961), When Harry Met Sally (1989), The Avengers (2012), and An Affair to Remember (1957). 10. PEOPLE STILL CALL IT HOME. The 2010 U.S. Census revealed that 25 mysterious individuals claimed Central Park as their permanent residence. Nobody knows who they are, and park representatives deny that municipal workers live on the grounds. One explanation is that homeless individuals might have mailed in census forms.